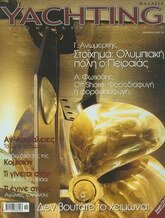 Alfa 51 is a project o architect G. Brillakis, who is very experienced in charters and repairing of sailing yachts and of ship-builder N. Kondilopoulos. 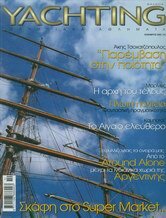 Both of them being well acquainted with the particular characteristics of yachting in Greece constructed a sailing yacht which combines functional design, good quality of construction and comparatively low price. 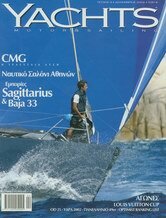 The above features make Alfa 51 very competitive in the yachts' market, especially for charters. The ship-yard is found at Oinofita and up till now four yachts have been built there. Design-Construction. The design of the hull is based on ship-building directions by Jacobs (J. & J. Designs) while the design of the deck is made by G. Brillakis. The hull is made by GRP, is additionally reinforced with deep frame and stringers and has antiosmotic protection. For the deck we used "sandwich" technology with G.R.P. and balsa wood. The keel is made of lead with bulb at the lower end, in order to have better hydrodynamic results and lower center of weight. The design and construction of the yacht has been approved by the Greek Register. Depending on the interior design it is produced in two different types. Either two cabins in the prow and the skipper's cabin separately or three cabins in the prow(?) and a corridor. Deck: Front we have the anchor with electric capstan Lofrans 1200 W. The mast, the boom and the boomwang are from aluminum. The main sail is Quantum and the main is full battery with Lazyjacks and genoa with roller reefing. 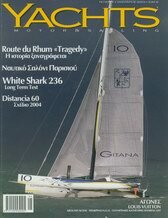 Two windless Andersen 46ST for main and two genoas 58ST for genoa and a small Andersen 28ST for genoas roller. The cockpit is quite spacious, lined with teak, as well as the rest of the deck. In the middle there is a steady table with benches on both sides. In the back there are two steering wheels with all the instruments, the engine controls on the right and the seats for the skipper. The stern is open and wide so that passengers will have easy access to the water in order to swim. The cockpit is covered by a big spray hood in the front and a bimini top further back, offering protection from the sun and the spray of the sea. There is plenty of storage room under the benches and the seats. Interior: When one enters the spacious interior, is impressed by the carefully made wood lining. On the right we have the galley with double stainless sink, stove with two burners, gus oven, electric ice-box, working bench and storage cabinets. Further back is the chart table, wide enough with navigation instruments and the electric panel. At the left side there is a large dinning room with two sofas where 10 persons can be seated. Two spacious double cabins are at the stern (?) and two at the prowwith their own bathroom each. The bulk-head (? ), which is found between the two prow cabins can be removed, giving one large cabin. The skipper's cabin is further front in the prow, relatively small, with lavatory and toilet under the bed. This cabin is not accessible from the inside but from an external hatch, in the front part of the deck. The twenty eight hatches create very pleasant conditions of natural light and ventilation. Engine-room: The engine room is under the stair, is easily accessible from three different spots and is lined with sound insulating material. The light is good and there is a blower for fresh air. The engine is Yanmar diesel 100 hp. The propeller shaft is stainless. Electrical systems 12 V + 220 V sockets. Bow thruster six water tanks made of stainless sheet-iron and one fuel tank 1000 liters.